Changes to CTF: You Guys Did What Now? 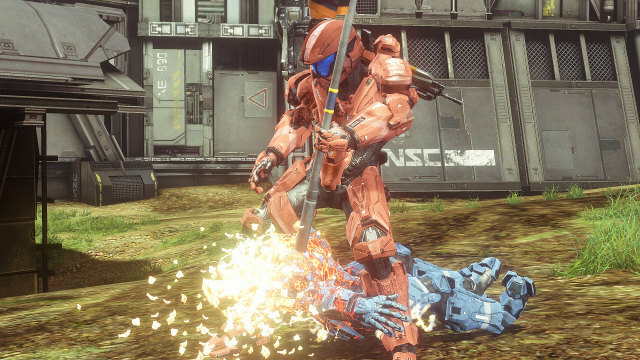 Yesterday folks got their first hands-on with Halo 4’s CTF mode, which 343 has updated in a whole bunch of ways. Some of them good, some that terrify me as an avid Team Objective player. So, what changed? Let’s list them out and then get into what’s good and what isn’t. Flag carriers now have full movement speed. Flag carriers are now armed with a pistol. Flag carriers are unable to drop the flag. Flag carriers have a large waypoint labeled “KILL” over their heads at all times. From the top, I guess. Increasing the flag carrier’s movement speed is something that should have happened two years ago with Reach. In a game with players who have a sprint ability, giving the flag carrier, the primary target, cement shoes is a crime. There’s a fine line between gimping the carrier (which we’ll get into very soon) and forcing teamwork naturally. Halo 2 and 3 made the carrier just enough of a lesser combatant to demand teamwork while not diminishing the individual. It does not look like 4 is continuing that tradition. In short, full speed is a good thing. Giving the flag carrier a weapon is an interesting one. If they wanted to make the flag carrier feel like he could defend himself, then great, that’s a way to do it. If it means that the flag is no longer a single-hit kill, then fantastic, I’m all for it. But here’s where that design falls apart. The guy can’t drop the flag and use his normal weapons, the ones he could have fought so hard to acquire. He is inherently a lesser combatant because an inferior weapon is forced on him. In previous games, it was important to make the choice early on in a flag run whether you were just going to go for it, balls out, and hope you made it to cover, or if you were going to drop the flag and engage with your precision weapon, hoping to outplay your pursuers. That choice is entirely gone. Out the window. You’re forced into using a six-shot clip, five-shot kill, blooming magnum instead of the rifle or rocket launcher or whatever that you have in your back pocket. You’re an immediate target who is inherently less capable of defending himself, not naturally, as was the case before (flag carriers usually took a few bullets before they were able to drop the flag, turn around, and start engaging), but because someone said so. Here’s the doozy. You’ve picked up the flag. You’ve got this weapon in your hand that you’re stuck with. Maybe you can take out one guy with it, and that’s all okay by itself, or acceptable, at least. But where you would make a very significant and core choice in previous games, there is nothing to decide: do I sneak the flag, or juggle it? Juggling lets you take a direct route at full speed at the expense of giving away your position to the folks that want to kill you. Lots of people do it because they think the risk is worth it. Personally, I’d rather keep my stealth and use a route they might not expect. Take the flag up the camo tower on Zanzibar rather than using the wheel well, try and run the flag through the back hallway on Headlong instead of dropping down, whatever. It was one of the most basic and obvious risk/reward mechanics in the series, one that Bungie was never able to accept. And it looks like 343 wasn’t willing to either, because the giant waypoint over the flag carrier’s head at all times eliminates any concept of flag sneaking. The flag carrier was always a high priority target, and it was always important for the team to protect him. They could do it in a direct way, by intercepting attackers as they tried to chase the carrier, they could spawn trap them so the enemy is forced to turtle up, or they could cause a distraction on one end of the map so that the carrier could sneak away. That last option is off the table now. There’s no guesswork and dramatically less map knowledge required to intercept a flag. Where previously you’d have to perform a quick judgement call on which route the carrier is most likely to take (Did he take it straight through the middle on Sanctuary? Would he have gone through the shotgun tunnel or up onto the brige? Maybe the rocks? ), now the game points out his exact position, practically shouting “HEY, YOU SHOULD PROBABLY BE SHOOTING HIM.” The carrier was a big target, always has been. Now he is an artificially-crafted beacon that can barely defend himself. Now, there’s no incentive to use anything but the most direct route or the one with the most cover. Options, player agency, those have been limited due to a HUD element, one that Halo 4 seems to be overly fond of (but that’s a topic for another time). Flagsassination, you are no Cheneymania. Combine the flag carrier being constantly visible with the fact that he can’t drop the flag. That means the waypoint cannot be removed until he dies. The flag is auto-pickup now, so you might be trying to grab that rocket launcher beside the flag but be stuck with a magnum instead. You’ve just marked yourself for death in a game where anybody with half a brain is going to spawn with a long-range rifle, and you can’t undo it. There’s certainly an argument to be made that this promotes teamwork. But remember what I mentioned before? There’s a fine line between gimping the carrier and forcing teamwork naturally. The flag carrier was always the key to winning the game. He was always going to be something people wanted to protect. But now the options that you have to protect him, the very definition of the word “protect” is diminished, narrowed, because the carrier has fewer options than ever before because he is broadcasted to the world and cannot defend himself at the level of anyone else in the match. Offense is naturally harder than defense. You’re assaulting an entrenched position with a small number of possible entrances that the enemy can set up shop near, and they’re just waiting for you to make your move. Reach Objective offense is ridiculously difficult against a similarly-skilled team, Asylum CTF matches, the most common, end 0-0 with alarming frequency due to the effectiveness of the main weapon, grenades, and the player count all being focused on a singular point on the map: the flag that’s being contested. Teamwork was already a requirement if you wanted to be serious about winning matches in that playlist. What does this do but make offense even more difficult through introduction of an incredibly artificial mechanic? The waypoint is the big deal to me. Everything else could work well enough if that were not in the mix. There’s giving your players good feedback, and there’s giving them too much information. This falls strictly into the latter category as far as I’m concerned. Caveat: I haven’t played the game. It might be awesome. I don’t know. I can only put these changes in the context of previous games in the series and how I would feel about them then. I feel that it generalizes well enough to make my predictions accurate. Maybe you disagree, and that’s fine. Just know where I’m coming from.